I fall somewhere between the proverbial rock and a hard place when it comes to my memories of The Adventures of Pete & Pete, which debuted as a half-hour series on Nickelodeon in 1993. Yes, I was a faithful viewer, but unlike the young teen target audience, I was an adult, well into my thirties at the time. I had a two-year-old stumbling around my house back then, and when I collapsed on the couch and bounced around channels trying to find something for us to wind down with after a long day of tripping over tiny toys, I came across The Adventures of Pete & Pete, a show that seemed like an alternative world version of The Wonder Years. The show is set in seemingly picture-perfect Wellsville (actually shot in various New Jersey locations), and follows the exploits of Wrigley brothers "Big" Pete (Michael Maronna) and "Little" Pete (Danny Tamberelli), and their slightly "off" family (Mom has a plate in her head and can pick up radio signals, Dad obsesses about the lawn) and their even more unusual friends, including nerdy Waldo-wannabe Artie (Toby Huss), the so-called "strongest man in the world." While I know that this was essentially a kid's show, I'm always drawn to the quirky and weird, so this worked for me on a regular basis. Sure, maybe because the lessons learned here are not exactly Rockwellian, but I'll take left-of-center any day. This two-disc set of the first season gathers up all eight episodes, as well as four of the half-hour "specials", so for all practical purposes there are twelve installments here. Their adventures, such as a stressful family car trip to the Hoover Dam or cramming for a school exam on the Revolutionary War, seem, on the surface, to be typical sit-com fare, but creators Will McRobb and Chris Viscardi continually skew and distort any level of normalcy. The result is jokes and gags that can go surreal or nonsensical (such as the school bus driver lamenting his lost love who takes a busload of kids on a neverending personal journey, or the pressure of being the dot for the "i" in the school marching band formation) without appearing to be strange just to be strange. Somehow, it all fit into the everyday weirdness that is Wellsville. Like The Wonder Years, there is the standard-issue narration to move the episodes along, but this particular off-balance universe seemed plunked out of some indie rock solar system, and as the series progressed there were recurring roles by such musical hipsters as Iggy Pop, Michael Stipe, Debbie Harry, Kate Pierson, Marshall Crenshaw, Juliana Hatfield, and Syd Straw. Crenshaw, Hatfield, and Straw show up during Season One, and represent the kind of casting that made this series so appealing to "older" viewers. And then there was that theme song from Polaris, the jangly Hey Sandy, which remains one of the best television theme songs ever—period—despite having nothing whatsoever to do with the characters or the premise. It's just a great song, and always my favorite part of each episode. Maybe someday I'll actually act my age. Image Transfer Review: The full-frame transfers are a rather ugly lot, with inconsistent quality that sometimes looks more like grainy mediocre video dubs than anything else. The Day of the Dot ep is particularly awful, with a long red horizontal line across the middle of the screen (a clear result of the video transfer) being the most distracting. Colors are soft overall, with quite a bit of grain throughout each episode. Here's hoping Paramount cleans up subsequent season sets. Audio Transfer Review: Audio is presented in 2.0 stereo, a simple mix that delivers clean dialogue without any major hiss problems. Extras Review: Paramount has packaged this set in two thin Nexpak cases housed in a thin cardboard slipcase; it's a bit hefty for two discs, looking like it contains more than it really does. Extras include three episode commentaries (What We Did on Our Summer Vacation, Day of the Dot, The Nightcrawlers) from series creators Will McRobb and Chris Viscardi, as well as director Katherine Dieckman. Energy levels are on the subdued side, and there are a few quiet spots, but the trio seem to have a good time reminiscing. They give props to the wacky ad libs of Toby Huss as strongman Artie, and offer the expected set of random anecdotes about the alt music cues and Jersey locations, in addition to pointing out their own blink-and-you-miss-them cameos. There is a great story about trying to get the rights to use a Pixies song, but having to pass when the cost was going to be $80,000. 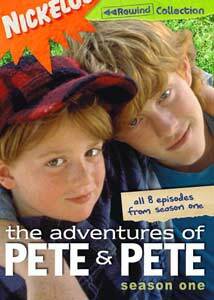 There are also two Pete & Pete Shorts, which were the original Nick bumpers that the show eventually grew out of. The Burping Room (01m:02s) and Mom's Plate (01m:02s) show the raw formation of what would follow, and though very short, are filled with the same kind of off-kilter comedy that McRobb and Viscardi carried forward when it went long form. The band Polaris are featured (well, their music, at least) in something called the Polaris Music Station. By following a constellation map, viewers can click and listen to six separate tunes—including the full version of the main theme Hey Sandy—as well as Waiting for October, Saturnine, Ashamed of the Story I Told, The Monsters Loose, and Ivy Boy. For a show that had possibly the hippest theme song of all time, this is excellent stuff. Horrible image transfers abound here, but the show still holds up as quirky and funny, and there is still something incredibly cool about the Polaris theme song.